Can I pair more than one audio source to one WONDERBOOM speaker? Title: Pair multiple Bluetooth devices with the WONDERBOOM Your WONDERBOOM can store up to eight paired devices in memory. NOTE: While the speaker can store up to eight paired devices, it can only maintain an active connection with two of them at a time. Pairing additional devices After you pair the first device (See “Set up the WONDERBOOM”), here’s how to pair additional devices: 1. Turn the speaker on. 2. Hold down the Bluetooth button (under the Power button) until you hear a tone. NOTE: The Bluetooth connection button will blink rapidly, indicating that the speaker is ready for pairing. 3. On your device, go to the Bluetooth menu and scan for devices. 4. Select WONDERBOOM from the list of devices. Once paired and connected, you’ll hear an audible confirmation from the speaker. Your WONDERBOOM is now ready to use with the device you added. NOTE: When you have two devices actively connected to your WONDERBOOM, you can easily switch between the two devices. Just start the music from the second connected device and it will become the source. Can I reset my WONDERBOOM? You can reset your WONDERBOOM back to its default, out of the box settings. Here’s how: Turn on your WONDERBOOM. Press and hold the Volume “-” and the Power button together for about 10-15 seconds. You will hear a tone to confirm the reset has completed. The WONDERBOOM will turn off. When you turn it on again, it will be ready to pair. Can I change the display name of my WONDERBOOM? For Android, you can change the display name of your WONDERBOOM in the Bluetooth device menu. Here’s how: Open the Bluetooth device menu. Locate your WONDERBOOM and tap the Settings icon next to it. Tap Rename and then enter the new name for your speaker. iOS Device You can’t change the display name of your WONDERBOOM in the iOS Bluetooth device menu. How waterproof is my WONDERBOOM? Your WONDERBOOM is rated IPX 7. This means it can survive immersion in 1 meter or 3.3 feet for up to 30 minutes. Can my WONDERBOOM DoubleUp or PartyUp with any other ULTIMATE EARS speakers? Your WONDERBOOM is in a league of its own. For that reason, it will only connect to other WONDERBOOM speakers. Is there a way to update the software on my WONDERBOOM? Your WONDERBOOM was created with the best possible features and will not need any updates to make it better. How can I check how much battery charge my WONDERBOOM? Is there an app I can download for my WONDERBOOM? Your WONDERBOOM doesn’t need or have an app — you can access all the fun features of your speaker without one. Do I need to clean my Ultimate Ears Speaker after using it in or around water? While we encourage you to take your Ultimate Ears Speaker wherever the party goes, we also want it to look great and last as long as possible. We highly recommend that you thoroughly rinse your Ultimate Ears Speaker with fresh water after using it in a swimming pool or the ocean. Once clean, allow the speaker to air dry completely before charging it. While the speaker is waterproof, the chemicals and salt in your pool or the ocean can damage the waterproof seals over time if not rinsed off after use. 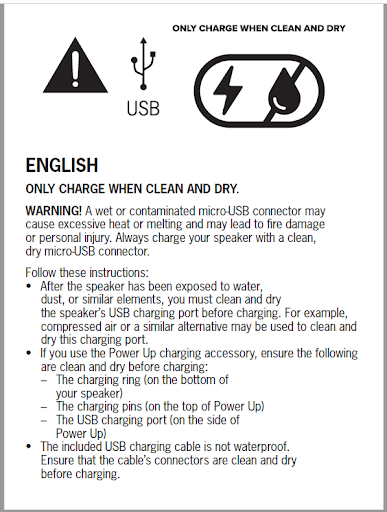 The micro-USB charging cable included with your Ultimate Ears Speaker is not waterproof. Never charge your Ultimate Ears Speaker if the micro-USB port, charging cable or connectors are wet, dirty or damaged. Always charge your speaker with a clean, dry micro-USB connector. If you think your cable or connector has been compromised in any way by water or other contaminants, do not use it to charge your speaker. Contact us for a replacement cable. Can I control the music I’m playing from my WONDERBOOM? You have some control over your music from your WONDERBOOM. Volume - Use the Volume +/- buttons to adjust the volume of your music: Android - You can independently control the volume from the speaker and from your source device. iOS - The volume is synchronized on your speaker and on your source device. Play/Pause - You can pause the current track by pressing once on the ULTIMATE EARS logo button on top of your speaker. Press again to resume the track. Track control - You can play the next track in your playlist by pressing twice quickly on the ULTIMATE EARS logo button on top of your speaker. How do I connect two WONDERBOOM speakers together? To Double Up two WONDERBOOM speakers, do the following: Make sure one of the speakers is connected to your source device. Press the ULTIMATE EARS logo button on both speakers at the same time and hold for three seconds until you hear the pairing tone. Once the speakers have successfully doubled up, you should hear a confirmation tone and music from both of your speakers. How do I get support for my Ultimate Ears WONDERBOOM? Overall playtime depends on how you use your Ultimate Ears Speaker, with things like the type of music and volume level all affecting the overall playtime. However, when played at roughly mid-volume, you can expect you can expect up to the listed hours of playtime from one full charge. Using the USB cable provided, and a standard USB port (e.g. Laptop) it will take approximately 5 hrs. 30 mins to recharge your Ultimate Ears Speaker to 100%. Wonderboom can also be charged with most USB chargers and times will be faster depending on the output of the USB charger you use. Never charge your Ultimate Ears Speaker if the micro-USB port, charging cable or connectors are wet, dirty or damaged. Always charge your speaker with a clean, dry micro-USB connector. If you think your cable or connector has been compromised in any way by water or other contaminants, do not use it to charge your speaker. Contact us for a replacement cable. Why won’t my Bluetooth device connect to my WONDERBOOM? What should I do if the audio is distorted or drops out on my WONDERBOOM? **Re-pair your device with your speaker **-- In your Bluetooth menu, find your speaker then Unpair or Forget the speaker. On your speaker, press and hold the Bluetooth connection button to place it in pairing mode. Find the speaker in the Bluetooth menu on your device to reconnect. If you’re using two ULTIMATE EARS speakers (in Double Up mode), try disconnecting and streaming to one speaker only. How do I set up my WONDERBOOM? Turn the speaker on by pressing the power button on the top of the speaker. The power indicator will glow white, and the Bluetooth connect button (above the ULTIMATE EARS LOGO) will blink white rapidly. Select WONDERBOOM from the list of devices. Once paired and connected, you’ll hear an audible confirmation from the speaker. This means your WONDERBOOM is ready to use. You can pair additional devices with your speaker. Q: How do I use my ULTIMATE EARS speaker with a computer? If this is the first device you’re pairing to your ULTIMATE EARS speaker, it’s ready to pair. Otherwise, hold down the Bluetooth button until you hear a tone. The Bluetooth connection button will blink rapidly, indicating the speaker is ready for pairing. Find and select your ULTIMATE EARS speaker in the Available Devices list, and then click Pair. If this is the first device you’re pairing to your ULTIMATE EARS speaker, it’s ready to pair. Otherwise, hold down the Bluetooth button until you hear a tone. NOTE: The Bluetooth connection button will blink rapidly, indicating the speaker is ready for pairing. Select your ULTIMATE EARS speaker from the list of devices, and then click Next. NOTE: If the Bluetooth Device Control window opens, expand the Headset type menu, select “My hands-free device “UE speaker” does not have a display”, and then click Apply. Under Sound, select Manage Audio Devices. Select “Speakers Bluetooth Hands-Free Audio” and click Set Default.